Some books are truly timeless, as they apply just as much today as when they were written. Such is the book, Tuesdays With Morrie by Mitch Albom. Having just finished this book with my parent book clubs and had such amazing, stimulating and uplifting discussions around this life-affirming book, I feel moved to impart some of his ideas that are perhaps even more important in today’s society. For as we are advancing in our technology and media, we are regressing in our humanism and connections, and losing much of what is valuable to our essence as people. Our quality of life is souring and falling. 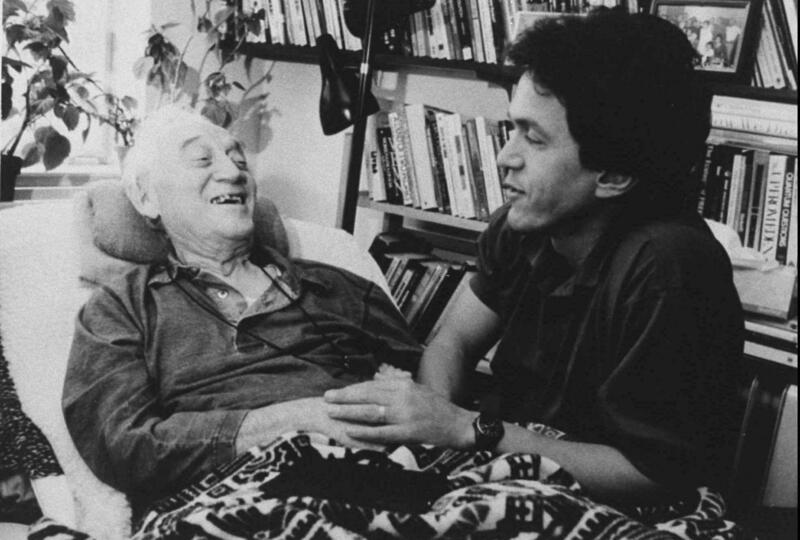 Morrie is dying of ALS (Lou Gehrig’s disease). “Do I wither up and disappear, or do I make the best of my time left?” As the author writes, “He would not wither. He would not be ashamed of dying. Instead, he would make death his final project. “ And so we are engaged in a profound, yet simple read of life lessons as openly shared in weekly discussions with his college student, Mitch Albom. Here’s to ‘Morrieisms’ as I call them – ideas and quotes from a man who found the keys to happiness and a well-lived life; what we all want and strive for. 1. Living funeral – Why wait until someone dies to pay tribute to them. “What a waste; all those people saying all those wonderful things, and Irv never got to hear any of it.” And so Morrie had a living funeral where he called on his close friends and family to join him so he could be a part of the laughing and crying as the eulogies were spoken to him. What important words can we shower our loved ones with now while they can hear them and know how their lives matter to us? Does this bring to mind anything of today’s world? Are we with the person in front of us when we’re with our smart phone?? What would Morrie say about that? I think he would be aghast at how we pay more attention to our screens than to each other. Do we take the time to embrace and engage in what truly matters to us? Do we give it our time and attention? What do we have to offer others? Our time, our ear, our talents, our service, our compassion…..
7. Number one?? “What’s wrong with being number two?” Mull this one over. Are we nothing if we’re not number one? Thanks for stopping by. Hope you got at least one great take-away from this. Would love to read your thoughts on this.